Wy-Kan-Ush-Mi Wa-Kish-Wit Plan Basic Principles - SOTSP. The following principles expand on the 1995 descriptions of our values and principles, reflecting a deeper understanding of our traditions and how they can be adapted to address changing circumstances. Honor tribal culture and values. Since time immemorial, the salmon have faithfully returned to the river to serve human and other needs. For native cultures in the Columbia Basin, the continuation of human life depends on the return of the salmon. 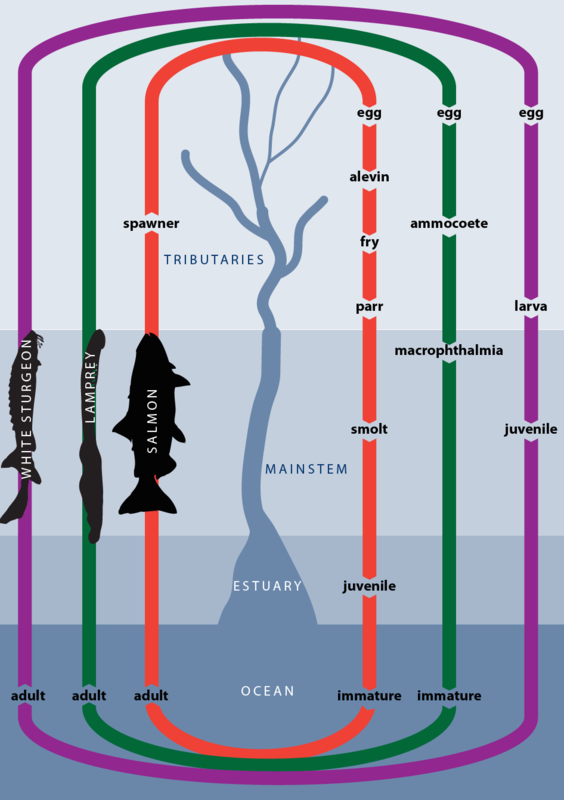 The interdependence of salmon and the people is the foremost example of what traditional native thinkers call the connectedness, or connection, of all life. In the basin’s native cultures, water and food were never taken for granted. Tribal society recognized that the earth’s water and food are always matters of survival and spiritual nourishment. This knowledge is the foundation of the tribes’ recommendations for Wy-Kan-Ush-Mi Wa-Kish-Wit or Spirit of the Salmon Plan. Fulfill tribal sovereignty, treaty rights and trust responsibility. The tribes co-manage fish resources pursuant to their inherent sovereignty and their 1855 treaty rights as interpreted by federal court decisions including U.S. v. Oregon and U.S. v. Washington. The Plan establishes a foundation for the United States government and its citizens to honor their treaty and trust responsibilities to the four tribes. Returning fish to the tribes’ usual and accustomed fishing places as guaranteed in the 1855 treaties would begin to meet the ceremonial, subsistence, and commercial needs of tribal members. Meeting these obligations benefits the non-Indian public, allowing people to enjoy their legal allotment of harvestable fish and share in a healthier, more natural river system. Integrate the best science with traditional ecological knowledge. An integrated approach provides a range of tools to understand and evaluate efforts to protect and restore the Columbia River Basin’s natural resources, particularly its riverine resources. The Umatilla River Vision is an excellent example of blending Western science and traditional knowledge. It supports the natural production and use of salmon and other fish by tribal members while describing the attributes of an ecologically functional river system in terms of hydrology, geomorphology, habitat connectivity, riparian vegetation, and aquatic biota. Put fish back in the rivers. The tribes’ longstanding commitment to reestablishing wild fish runs is based on traditional values. To achieve this central goal, the Plan includes a propagation strategy the tribes call supplementation. Rather than perpetuating the dominant hatchery rearing and release paradigm, which focuses on hatchery returns for harvest, supplementation uses hatchery technology to rebuild naturally spawning fish stocks while also providing harvest. Supplementation is essential because, in so many situations, needed remedial actions are not being implemented and those that are cannot be implemented quickly enough or on a scale that is large enough to halt further population losses. Also see Reintroduction. Protect watersheds where fish live now and historically. To support anadromous fish, Columbia Basin riverine and aquatic habitats must be returned to natural conditions closer to those that existed prior to dam construction, irrigation withdrawals, forest clearcuts, cattle grazing, metal mining, urbanization, and other consumptive uses. Salmon and lamprey need connected migratory habitat that supports biological functioning throughout their life cycle, not just fragments of good habitat here and there. The Plan describes how the basin’s watersheds can be protected and how degraded areas can be rehabilitated and identifies where fish need to be reintroduced or supplemented. (See Subbasin Plans, Watersheds and Watershed Restoration.) To return the basin to health and productivity, the tribes seek to engage their watershed neighbors in local, collaborative efforts. Manage gravel-to-gravel. The Plan’s technical recommendations are aimed at increasing survival at each stage of the anadromous life cycle from spawning gravel to spawning gravel—from eggs hatching in the streambed gravel to juveniles migrating downstream through dams and reservoirs to saltwater homes where they feed and grow to adult fish and then return to spawn in freshwater gravel to begin the process again. Use adaptive management. Adaptive principles allow resource managers to take immediate on-the-ground actions to reverse anadromous fish decline even in the face of scientific uncertainty. The tribes’ technical recommendations are designed as testable hypotheses: they define problems, propose remedial actions, set objectives, and describe means to evaluate the actions. Using this adaptive management framework, restoration actions can be modified as indicated by scientific evaluation. The anadromous fish life cycle extends from spawning gravel to spawning gravel—from eggs hatching in streambed gravel to juveniles migrating downstream to the ocean through dams and reservoirs to feeding and growing in saltwater to adults returning to spawn in freshwater gravel to begin the process again.